Most of the world's photographs are taken between zero and six feet from the ground. Wildlife biologists love their camera traps, and one group finally decided to place some in the trees of a tropical rainforest, nearly 90 feet high. Here's what they found. In Peru, a strip of rainforest was mowed down recently for a natural gas pipeline. Thankfully, someone had the sense to retain some "natural bridges" to connect the bifurcated forest. Pairs of branches jutting out from trees on either side of the cleared space that were long enough to connect in the middle were left in place so that critters could scurry across from one side to the other. Along five kilometers of the cleared path, thirteen branch-bridges were left for wildlife. 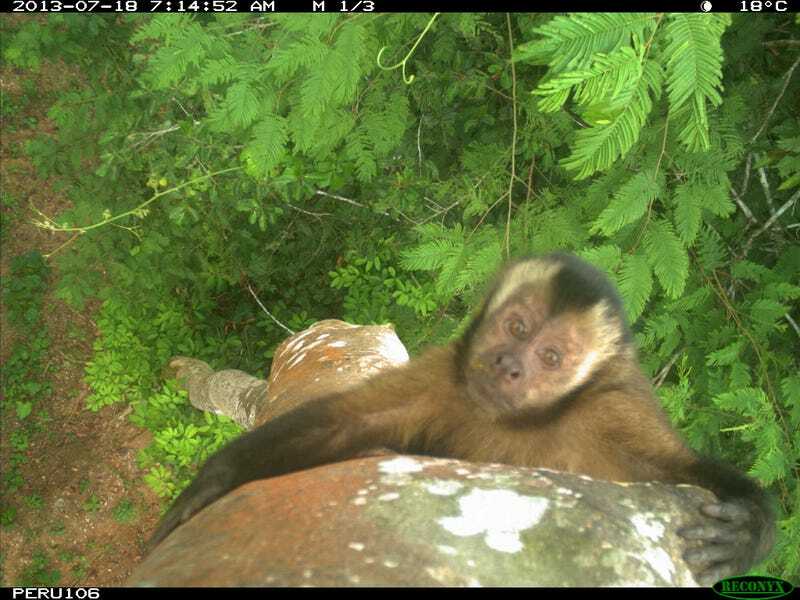 Above: A juvenile brown capuchin. That gave Tremaine Gregory, a research scientist at the Smithsonian Conservation Biology Institute, an idea. She wanted to outfit those bridges with camera traps, which are usually used to monitor terrestrial, not arboreal species. Thanks to wind, sun, leaves and bugs, almost 98% of the pictures taken over 6 months were the accidental kind... Once researchers removed all the extras, they were left with more than 8,000 photos showing 22 mammal species, 20 birds, and 4 reptiles. They saw more animals at night than during the day. This was especially exciting, Gregory says, because a recent study on the ground had turned up very few primates—perhaps some of these primates were hiding out during the day, and not simply depleted by hunting. The photos showed that animals didn't change their behavior over time to avoid the cameras. They also revealed that animals are using the natural bridges often. Those using the bridges don't like to cross on open ground—the 17 mammal species photographed on the ground had almost no overlap with those in the trees. Gregory ran into some unexpected problems with her camera traps nine stories off the ground. Some of the cameras became infested with insects, for example, which doesn't usually happen on the ground. Four of them were chewed open by tree porcupines. Still, she discovered a whole world high up in the canopy that ground-based cameras could never reveal. Head on over to Inkfish for more information and lots of photos, or check out the (paywalled) paper in Methods in Ecology and Evolution.